It’s Monday night and time to get tactical in the kitchen. 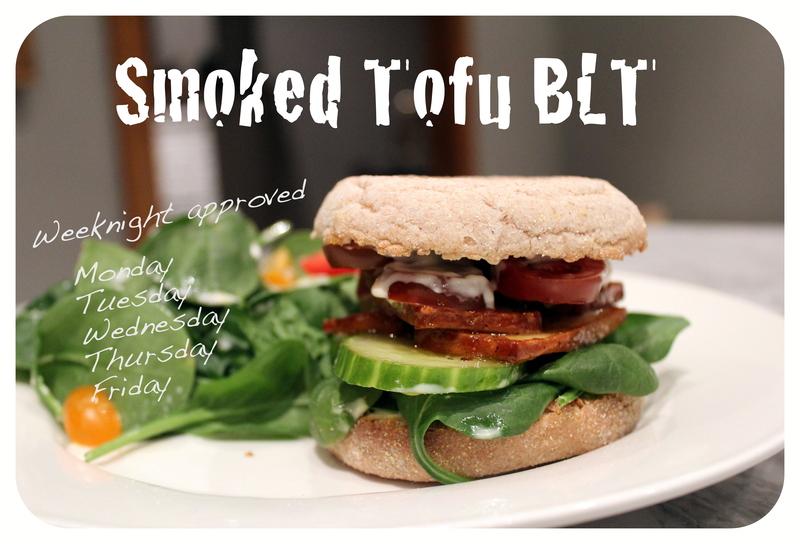 Enter the smokey tofu BLT sandwich: served on a toasted wholewheat English muffin and with tofu instead of bacon, this weeknight go-to is as yummy as it is healthy. Plus, it takes only 10 minutes to put on the table. In a large non-stick skillet, heat olive oil over medium-high heat. Sprinkle both sides of tofu strips with nutritional yeast, salt & pepper and cayenne if using. Drop into the hot pan and add the maple syrup; sear each side for about 1 minute, until golden and crispy. Build your sandwich using condiments, veggies and seared tofu. Serve with your favorite soup or salad. Perfectly ripe, flavorful tomatoes are a must-have for this dish. In winter months we use cocktail tomatoes instead of full-sized ones; they’re far superior in taste and texture. We also use spinach in place of regular lettuce. Yum and yum. This entry was tagged dinner, lunch, toddler, Vegan, Vegetarian, weeknight. Bookmark the permalink.